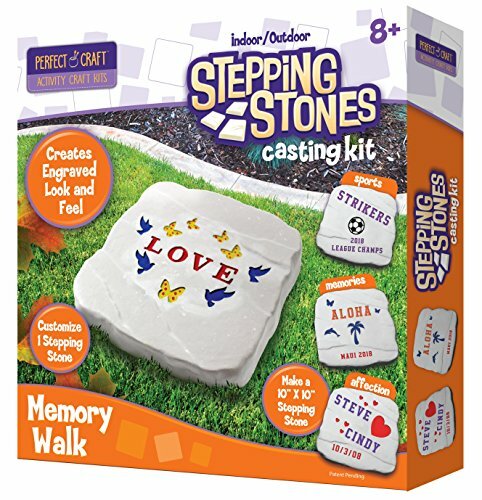 Daily Make Your Own Stepping Stones Deals. Halloween Store. Incredible selection of Halloween Costumes, Halloween Decorations and more! 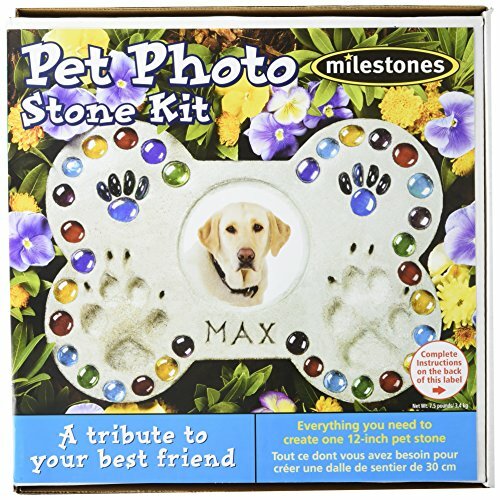 MILESTONES-Pet Photo Stone Kit. Everything you need to create one 12 inch pet stone. Decorate your own garden or make it as a gift! 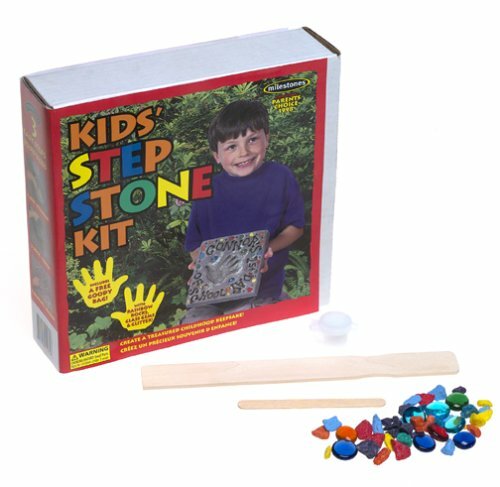 This kit contains 7 pounds of Stepping Stone Mix, one 12 inch reusable plastic molds, 1 acrylic photo lens and sticker, 6 ounces of glass gems of varying color, 20 double-sided letter and number stamps, 1 craft stick and instructions. Conforms to ASTM D4236. WARNING: CHOKING HAZARD-Small Parts. Not for children under 3 years. Made in USA. 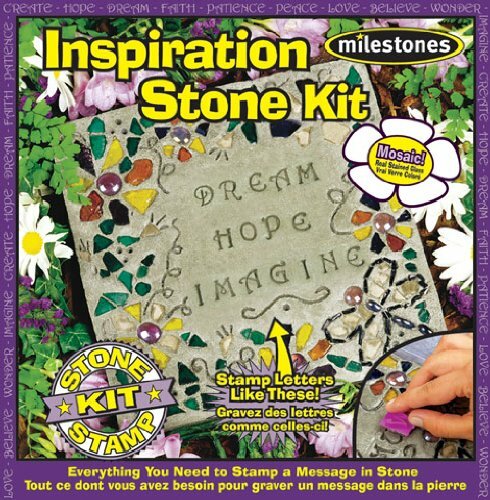 MILESTONES-Daisy Mosaic Stepping Stone Kit. Everything you need to create one 12 inch stepping stone. Decorate your own garden or make it as a gift! 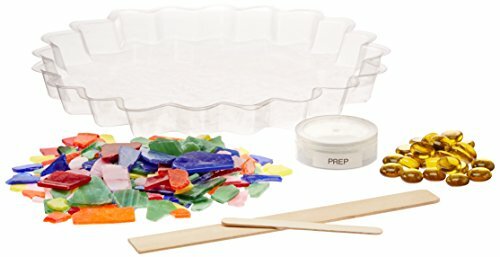 This kit contains 7lbs of Stepping Stone Mix, one 12 inch reusable plastic mold, 1 pound of real stained glass pieces, 3 ounces of glass gems, one wooden paddle and writing tool, and instructions. Conforms to ASTM D4236. WARNING: CHOKING HAZARD-Small Parts. Not for children under 3 years. Made in USA. Add inspiration to any garden with this charming mosaic stepping stone kit. Stamp an inspirational message and create a work of art that will last for years. The kit includes a 12-Inch reusable plastic square mold, earth toned stained glass pieces, glass gems, stone stamping letters and numbers, wooden mixing and writing tools with easy to follow instructions. Finished dimensions are approximately 12-Inch by 12-Inch. 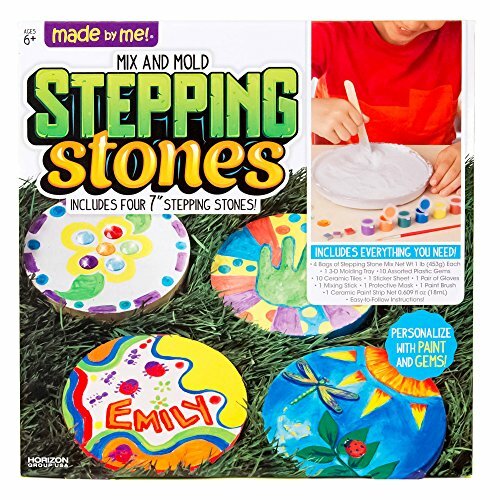 Give your children a plaster-based craft they will love with the 4M Make Your Garden Stepping Stone Kit. 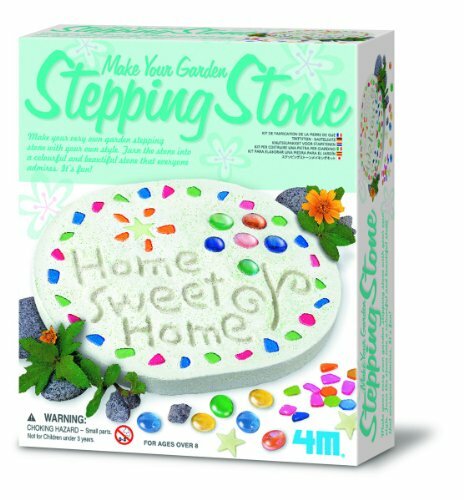 Create a colorful and beautiful garden stepping stone keepsake that everyone will stop to admire; everything you need is included in this garden stone craft set. Your decorative stepping stone sparkles and glows in the moonlight, adding great beauty to an everyday landscape. This kit contains 1 ready-to-decorate stepping stone measuring 5.5-inch x 7.5-inch x 2-1/4-inch. Give your child the gift of arts and crafts with toys that foster creativity and hands-on learning. Recommended for ages 3 and up. This all-weather stepping stone from MindWare is the perfect gift for girls and boys ages 6 and up. 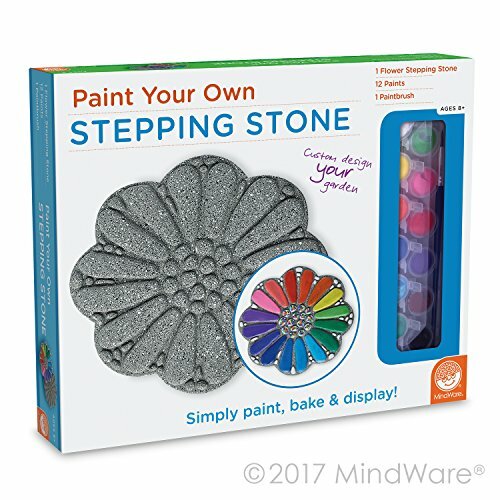 This stepping stone is ready to paint right out of the box, letting you skip messy cement-mixing and get right to the fun part: decorating and personalizing! A dozen vibrant paints allow for endless creativity-mix, blend and add custom color accents. Once painted, bake the stone in your oven for a long-lasting, weather-resistant finish. Display one stepping stone or make a whole pathway to transform your garden, backyard or patio!